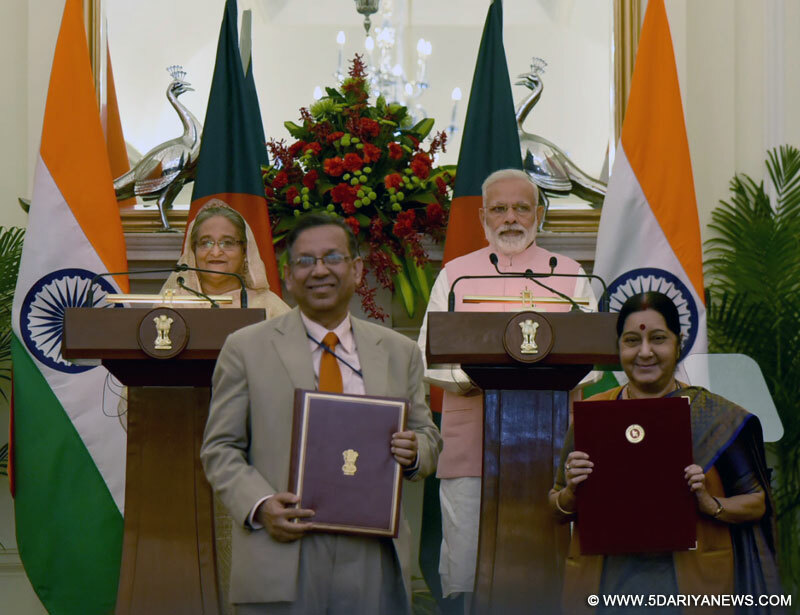 India and Bangladesh on Saturday signed 22 agreements in the fields of defence cooperation, civil nuclear energy, space and cyber security among others, following bilateral talks between Prime Minister Narendra Modi and his Bangladeshi counterpart Sheikh Hasina.India and Bangladesh signed a Memorandum of Understanding (MoU) through which India would extend a line of credit of $500 million to support Bangladesh's defence-related procurements.Three more MoUs were signed to enhance defence cooperation between the two countries.To enhance cooperation in national security and strategic and operational studies, two MoUs were signed, one between the Defence Services Staff College (India) and the Defence Services Command and Staff College (Bangladesh) and another between the National Defence College, Bangladesh and the National Defence College, New Delhi.Two agreements were signed on cooperation in the peaceful use of nuclear energy and cooperation in the regulation of nuclear safety.An inter agency agreement was signed between the Global Centre for Nuclear Energy Partnership (GCNEP) of India and the Bangladesh Atomic Energy Commission (BAEC) pertaining to nuclear power plant projects in Bangladesh. An MoU was signed to cooperate in the area of Cyber Security through Indian Computer Emergency Response Team (CERT-In) and Bangladesh Government Computer Incident Response Team (BGD e-Gov CIRT).India and Bangladesh also signed a financing agreement for the construction of 36 community clinics in Bangladesh.An MoU was signed for establishing Border Haats along the India-Bangladesh border.Two MoUs were signed for cooperation in judicial training and capacity building. An MoU was signed for the development of fairway from Sirajganj to Daikhowa and Ashuganj to Zakiganj on the Indo-Bangladesh Protocol Route. Another MoU was signed on Passenger and Cruise Services on the Coastal and Protocol Route between the two neighbours.The shipping ministries of the two countries signed an MoU to help each other in navigation.The two sides signed agreements for cooperation in earth sciences, space, mass media, information technology and the peaceful use of outer space.